Welcome to Wesley Family Medicine Residency! I am so glad that you are taking the time to learn a little bit more about our program. Hopefully as you explore our website you will find answers to your questions and will begin to develop an appreciation for the culture of our program. I chose to work at Wesley Family Medicine Residency because of the wonderful people, outstanding patient care and the chance to educate some pretty incredible residents. In short, it’s fun to be a family physician at Wesley! Our residents have a pretty rigorous educational program in order to ensure that a graduate is able to practice in whatever community is the right fit for them. Whether choosing to work as a hospitalist or practicing full scope family medicine in a rural community, a Wesley graduate will have the skills and knowledge necessary to be successful. All residents complete rotations that provide them with strong inpatient, maternity, pediatric and outpatient skills that prepare them in the fundamentals of family medicine. Too, our residents have lots of opportunity to become proficient at procedures including skills in colonoscopy, C-sections, colposcopy and joint injections to name a few. However, we recognize that not every resident envisions the same future practice. Through a wide variety of elective choices and longitudinal experiences, residents can customize their education to gain extra skills or place special emphasis on knowledge areas that will be critical to their future goals. I think it is the best of both worlds—strong fundamentals and the chance to customize your education to meet your unique needs. When you walk through the doors of Wesley Family Medicine, you’re likely to see lots of smiles and hear laughter as residents and faculty work companionably together to give their patients the best care possible. Although being a resident is hard work, at Wesley Family Medicine we strive to create an atmosphere of support and camaraderie that makes the hours spent here enjoyable. As one of the oldest family medicine residency programs in the country, Wesley Family Medicine has a long history of preparing graduates to be outstanding family physicians regardless of what they choose as a location and scope for their practice. I am proud to be part of that tradition. I hope that you have the opportunity to meet us in person and learn more about our program. We look forward to welcoming you to Wesley Family Medicine Residency! The Wesley Family Medicine Residency Program graduates full-spectrum family physician leaders who provide high quality, cost effective, compassionate healthcare in communities of every size and location. Our program is founded on six core principles originally described by the residency’s founder, G. Gayle Stephens, MD. A Family Physician is a technically competent, autonomous professional. A Family Physician considers the whole person, not simply an isolated symptom, disease state or organ system. A Family Physician must be exposed during his/her education to a model family medicine practice to learn the virtues of wisdom, honesty and judgement. A Family Physician cannot be trained solely in the ambulatory environment; rather, he/she must be competent in hospital care of adults and children, obstetric and intensive care. A Family Physician must be trained with a formalized curriculum in behavioral and mental health. A Family Physician must be reflective about him/herself. If the physician is often the therapeutic agent of greatest consequence then it becomes imperative that he/she learn his/her assets, liabilities, foibles and idiosyncrasies. One of the defining characteristics of training at Wesley is the number of procedures that fall within the scope of our practice. Wesley Family Medicine offers training in a wide variety of inpatient and outpatient procedures to better equip our residents for their future practices. Wesley Family Medicine offers clerkship rotations for third-year medical students and sub-internship and advanced residency perspective rotations for fourth-year medical students We are sorry; We are unable to provide externships or observerships. Rotations range from two to four weeks, depending upon the student’s schedule and desired experience(s). For more information and to schedule a rotation with WFM, please contact Nina Nguyen, Residency Program Coordinator, nina.nguyen3@wesleymc.com. 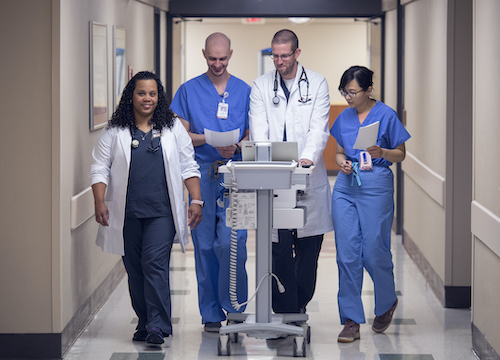 Wesley Family Medicine provides a curriculum that is broad-based, flexible and offers a number of electives to tailor your residency training according to your interests. We have helped residents to tailor their curriculums to include emphases in advanced maternity care, the provision of care to patients with HIV, global health and disaster response, and sports medicine, among others. We want to help you get the training and achieve the confidence you need to practice in whatever setting you desire. See attached for 2018-2019 Curriculum List. First-year residents spend, on average, two half days seeing their own patients at the Wesley Family Medicine Center. To make sure our residents have time to orient to their new duties, their first rotation with us is dedicated to learning the ropes. Residents are introduced to the hospital system, our community resources, the ins and outs of the Family Medicine Center, and get to start caring for their own patients. The new residents attend didactic and clinical education sessions and receive training and certification in ALSO and NRP. During this July rotation, all call shifts are double-covered (with two senior residents) to assist the new PG1s with their transition. Working under the supervision of experienced OB and family medicine attendings allows residents to improve their skills and gain autonomy. WFM residents take care of the majority of patients delivering at Wesley’s BirthCare Center, and residents are expected to perform as primary surgeon on c-sections and to manage high-risk labors. Wesley Family Medicine also partners with Wichita’s GraceMed Health Clinic to provide OB care to the unemployed, underinsured and underserved persons in central Kansas and to give residents the opportunity to manage more OB cases. Residents care for normal newborns and special care nursery babies, with an emphasis on gaining experience in the rapid treatment of infants needing further support or intervention. The family medicine residents admit and receive all newborns. The rotation offers plentiful experience in circumcision techniques, and teaching rounds and didactics are provided regularly by the pediatric faculty. PGY1 residents complete two rotations in Wesley Medical Center’s very busy and diverse inpatient service where they are supervised by pediatric faculty. 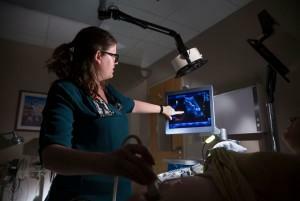 Family medicine residents respond to all pediatric code blues and work in Wesley’s state-of-the-art PICU. This rotation also allows residents to care for great numbers of pediatric oncology patients, as Wichita serves as a rural reference source for adult and pediatric oncology patients. 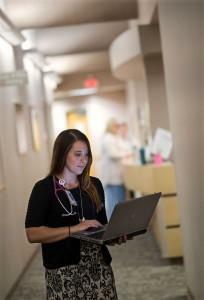 Residents spend two rotations as a member of the Wesley Family Medicine Inpatient Service. Residents run codes, perform inpatient procedures, and attend regular didactic attending rounds. They also round on their patients, including pediatric, adult and intensive-care-unit patients, and take calls on their patients’ progress during the evenings. Residents provide primary patient management, and attending physicians are present to support and teach. This rotation allows residents to greatly enhance their ICU medicine knowledge. Wesley has the largest emergency department in Kansas and serves as a regional referral center with Level 1 trauma certification. It is also home to Kansas’ only Pediatric Emergency Department. Residents log more than 120 hours in the ED during this rotation, working alongside emergency medicine attendings. Residents spend time as upper levels, helping to perform procedures and stabilize and manage critical patients. Residents evaluate and do work-ups on acute surgical emergencies and participate in surgeries and consultations. Operative experience is tailored to each resident’s interests. Residents gain experience in colonoscopy and EGD and in procedures like casting, suturing, splinting, and lumbar punctures. Residents also run codes, including intubation, when necessary. The family medicine residents serve as the only in-house trauma residents. Working directly under trauma surgeons, they respond to all Level 1 and 2 traumas, run trauma codes, perform critical care procedures (including chest tubes, central and ART lines, and tracheostomies and PEG tube placement), surgeries and post-operative care. Residents are responsible for caring for surgical ICU patients, including their ventilator management. In addition to a longitudinal experience in the Family Medicine Center, residents are required to complete two block rotations dedicated to the ambulatory care of children. One block, Outpatient Pediatrics-1, is a required rotation in the PGY-1 year and focuses on general, ambulatory concerns. Second-year residents spend, on average, three half days seeing their own patients at the Wesley Family Medicine Center. Working with pulmonologists in the community, PG2 residents gain an understanding for how best to treat chronic lung conditions such as COPD. They also learn how to interpret pulmonary function tests and office spirometry. During their PG2 year, each resident will spend one rotation block with the Wesley hospitalists (HCA’s flagship hospitalist group of med-peds and family medicine attendings who have won numerous teaching awards). The resident will spend another block serving as the acting chief on the Wesley Family Medicine Inpatient Service (which is a great responsibility; they will oversee the WFM intern and monitor all patients). Residents run codes, perform inpatient procedures, and attend regular didactic attending rounds. Residents will care for patients in various venues such as the office, inpatient acute care unit, nursing home care and skilled nursing unit (SNU). The resident participates in interdisciplinary team meetings and hospice care. The resident completes a reading list, ABFM KSA, home visits and several on-line modules related to care of the elderly. In addition to a longitudinal experience in the Family Medicine Center, residents are required to complete two block rotations dedicated to the ambulatory care of children. Outpatient Pediatrics-2, is a required rotation in the PGY-2 year and is designed to allow the resident to have concentrated exposure to adolescent patients and patients with neurological concerns. Third-year residents spend, on average, three to five half days seeing their own patients at the Wesley Family Medicine Center. During their PG3 year, each resident will spend two rotation blocks as the acting chief on the Wesley Family Medicine Inpatient Service (which is a great responsibility; they will oversee the WFM intern and monitor all patients). Residents run codes, perform inpatient procedures, attend regular didactic attending rounds, and learn hospital billing. They also round on their patients, including pediatrics, adults and intensive-care-unit patients, and take calls on their patients’ progress during the evenings. Residents provide primary patient management, and attending physicians are present to support and teach. Residents work with outstanding and award-winning attending physicians to gain experience in a number of areas (inpatient and outpatient, EKGs, treadmills, echocardiograms, etc.). The two-week ENT rotation will residents to diagnose and treat common ENT ailments and recognize complicated conditions for referral to the specialist. The two-week Opthalmology rotation will help residents develop the skills to recognize and diagnose problems of the eye. The resident should learn what eye problems can be handled in the office and which require referral. While spending time with family physicians and gynecologists, residents will develop skills in evaluating and managing gynecological symptoms, diseases and disorders as well as acquire knowledge regarding the appropriate indications for referral to a gynecologist for further management. During this rotation, residents will acquire and augment skills in caring for patients with diverse acute and chronic musculoskeletal concerns. In addition, residents will receive education in orthopedics on a longitudinal basis during their continuity office practice and through the didactic curriculum. Depending on their interests and career goals, residents can choose to complete either a rural or international medicine rotation. Residents who choose to do a rural rotation go to Dodge City, Kansas, or Winfield, Kansas, where they are teamed with a family physician. Here, they experience life as a “small-town family doctor.” The busy experience includes practicing full-scope family medicine; time is spent in an outpatient clinic and at the medical center, where residents gain skills in emergency medicine, trauma, operative obstetrics, surgery, and more. Residents are provided with housing (which can accommodate spouse and children, if needed) and on-call meals. Residents who wish to do an international rotation spend time abroad in the setting of their choice. Before departure, residents study formal global health, tropical infectious disease, and public health modules. Upon their return, residents present a noon conference for their peers and faculty so as to share what they experienced and learned. During this rotation the resident is under the direct supervision of an attending Orthopedist, in their office and other settings as appropriate (training room, Operating Room). The two-week urology rotation will help residents develop knowledge of both surgical and non-surgical aspects of diagnosing and treating urological disease. During the two-week wound care rotation, residents are assigned to a team of attending, mid-level providers and nurses working collaboratively as a wound care team at the hospital and clinic. During this rotation the resident is under the direct supervision of a private, community endocrinologist, and occasionally other endocrinologists within the group who are covering. The resident can expect to perform endocrinology consultations, round daily on hospitalized patients, attend endocrinology clinic with their attending, and observe endocrinology specific procedures such as thyroid sonogram and biopsy. The resident sees infectious disease patients with a private infectious disease specialist in the hospital and in his/her office. Infectious disease procedures are observed and performed as available. During this rotation the resident is under the direct supervision of a private, community nephrologist, and occasionally other nephrologists within the group who are covering. The resident can expect to perform nephrology consultations and round daily on hospitalized patients, actively participating in their management under the direction of the attending nephrologist. The resident sees rheumatology patients with a private rheumatologist in his/her office. Rheumatology procedures are observed and performed as available. Teaching will be provided through rounding on a selection of critically ill adults in the medical intensive care unit. The resident can expect to work with a variety of hospitalists, specialists, and critical care pharmacists during this experience. Residents will be responsible for orchestrating transfers to lower acuity units and will be expected to perform admissions and discharges with the aid of their attendings. Teaching will occur primarily through rounding on critically ill infants and children followed by group rounds with the critical care team. The resident will have the opportunity to take call in the PICU as well as perform daily rounds and activities. The resident will be responsible for admissions and transfers to lower acuity units during this rotation. Teaching will be provided through exposure to critically ill adult patients in the Surgical Intensive Care Unit, individual rounding and group rounding with the Trauma and Surgical ICU team. Residents will also be expected to respond to Level 1 traumas and are allowed to respond to Level 2 traumas. They will have the opportunity to take overnight call. During their PG2 and PG3 years, residents choose five blocks of elective rotations to augment their curriculum. Wesley Family Medicine has structured a number of elective possibilities in various areas of medicine, including medicine-pediatrics, obstetrics, and internal medicine. If desired, faculty members also work with residents to structure new electives. Please see the Curriculum List 2017-2018 for possibilities (hyperlink to attached). Note: Wesley Family Medicine does not pre-match. These are the program’s general guidelines. They are not set in stone; changes and exceptions can be made at the discretion of the Program Director. Benefits Resident contracts are administered through the Wichita Center for Graduate Medical Education (WCGME). This organization coordinates the salaries and benefits for all residencies in Wichita. WCGME is an equal opportunity employer. Residents have outstanding medical, dental, and vision benefits, and their dependents are offered health and dental insurance for a reasonable additional cost. Life, long-term disability and professional liability insurance are also provided for residents. Residents receive three weeks’ worth of vacation, five day of educational leave, and ten days of sick each year. They also receive a $1,000 annual educational allowance and meal allowances during their on-call periods, among other benefits. For detailed information about resident benefits, see the WCGME benefits page. Most people from outside Wichita don’t know much about our wonderful city. For instance, did you know we were named by Forbes and Money magazines as one of the best cities to live in the United States? There is more than enough to do here, regardless of your interests or personality of if you’re single or have a family – we’re sure you’ll be happy here. Wichita is a young, diverse city with a rapidly developing downtown and commerce districts. This makes for both excellent medical training and a great place to be when you’re not at work. Explore some of the links to the right, but also feel free to explore our city on your own, on Google or in person, and find out what we did – Wichita is simply a wonderful place to live! Wesley Family Medicine is proud to be sponsored by the University of Kansas School of Medicine-Wichita.